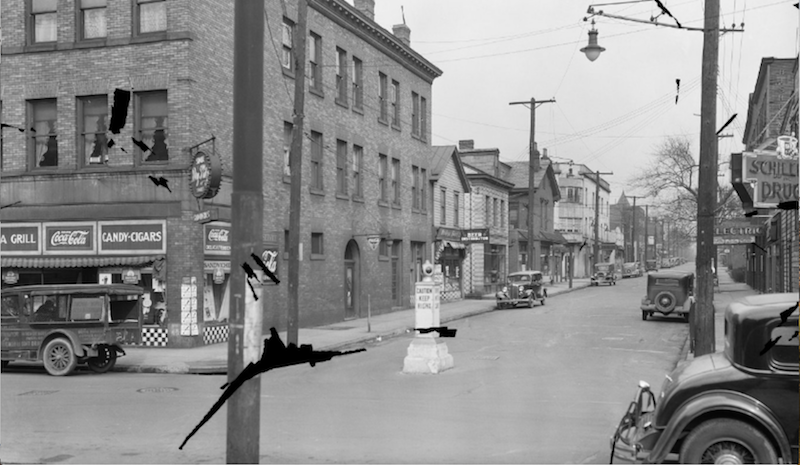 A Pittsburgh city photographer stood on the corner with Ellsworth Avenue (left) and South Highland Avenue (right) and took a photograph pointing straight across to the corner, behind a person crossing the street, of Centre Avenue (across street and right) and South Highland Avenue (across street and left). October 29, 1917. Image courtesy of Historic Pittsburgh, the Digital Research Library at the University of Pittsburgh. 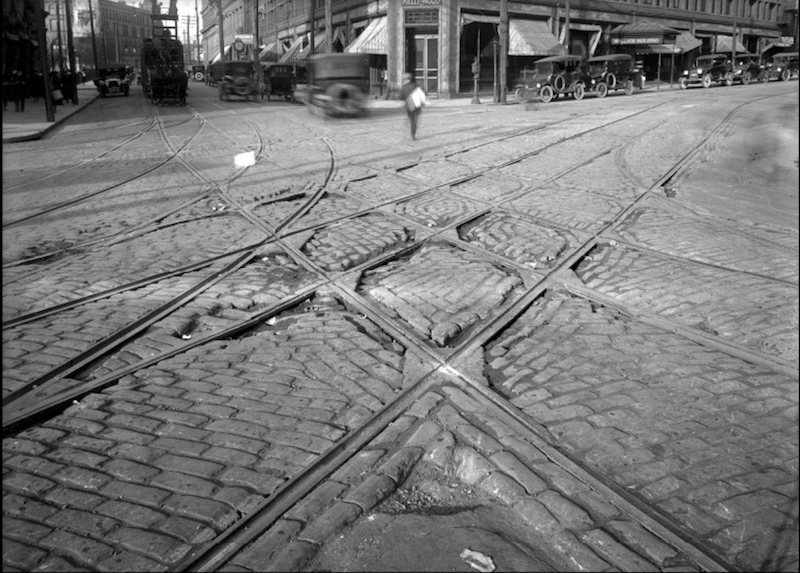 A hundred years ago Ellsworth Avenue crossed over a bridge from where Ellsworth Avenue intersects with Spahr Street today, spanned the Pennsylvania Railroad tracks, and ended at the five way intersection shown in the image above (taken on October 29, 1917). In the image, Centre Avenue runs from far right, straight through the intersection in front of parked cars, and past the corner across the intersection at far left. South Highland Avenue runs from the right lower corner and through the intersection to where a street car and automobiles are seen on the move. To the immediate left, Ellsworth Avenue meets the intersection. Currently the Patron Mexican Grill is in the building visible directly across the intersection. This entry was posted in Uncategorized on January 18, 2018 by don. Looking down Walnut Street from South Aiken Avenue, February 19, 1935. Image courtesy of Historic Pittsburgh, the Digital Research Library at the University of Pittsburgh. It’s difficult to find historic photographs of commercial Walnut Street, which is surprising given the area’s popularity. In the 1935 image above, we can recognize buildings like the fifth building down Walnut Street (left side) known as the Minnetonka Building (1908). Designed by Frank G. Scheibler Jr., the Minnetonka Building now houses the Shadyside Variety Store, Mazur Galleries, and Cappy’s Cafe. Schiller’s Drug Store sign is visible at far right on the corner of Aiken and Walnut. Perhaps you have an early photograph of Walnut Street? Please share it with us! This entry was posted in Uncategorized on December 26, 2017 by don. 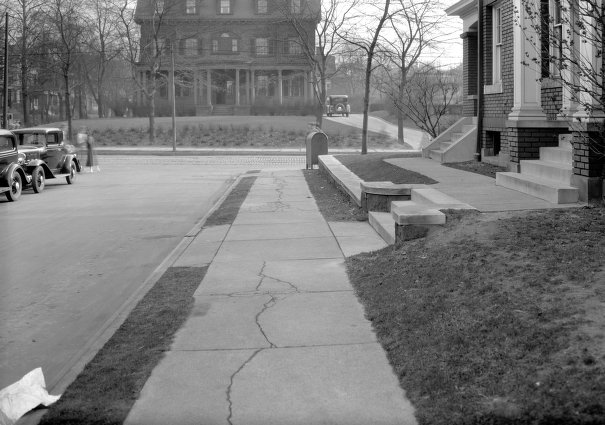 The house at 5238 Ellsworth Avenue as viewed from Saint James Place on January 19, 1934. 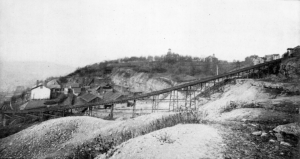 Image courtesy of Historic Pittsburgh, the Digital Research Library at the University of Pittsburgh. The house in the 1934 image above remains standing today at 5238 Ellsworth Avenue and looks very much the same except that it no longer sports a grand porch. At the time of this photograph, George S. Oliver lived in the house with his wife Laura. Mr. Oliver was a lawyer by training but since 1900 helped to run his father’s newspaper the Pittsburgh Gazette. After he married on June 1, 1910, he and his bride and his father George T. Oliver, II moved into his bride’s childhood home. George S. Oliver took control of the Pittsburgh Gazette after his father died. Later, he bought the Pittsburgh Chronicle Telegraph and Pittsburgh Times and then sold all three papers to William Randolph Hearst on August 1, 1927. During the first half of the twentieth century two closely knit families and their staff lived at 5238 Ellsworth Avenue and for much of that time, George S. Oliver and his wife Laura often appeared in Pittsburgh newspapers. After all, they owned many of them! Usually they had attended a fabulous social event, sometimes they were traveling, and occasionally business was announced. The full maiden name of Mr. Oliver’s wife was Laura Gilpen Smith. She was the daughter of Persifor Fraser Smith who had lived at 5238 Ellsworth Avenue since her father’s father, L. W. Smith, was head of the house. A colonel in the Civil War, L. W. Smith lived at 5238 Ellsworth Avenue with his wife Laura Gilpin Wood (her maiden name), butlers Emmett Davis and Alex Kidd, housekeeper Ellen Friel, and coachman James Grave. Some of the staff at 5238 Ellsworth became long term residents. Emmett Davis had been a butler since at least as early as 1905. By 1928 Mr. Davis had become chauffeur. He was probably chauffeur of the car visible in the house’s driveway. By 1923 Emmett Davis was advertising his chiropractor practice at 5238 Ellsworth. Mr. Davis had married a woman named Minnie, an active organizer and participant in the Married Women’s Culture club. 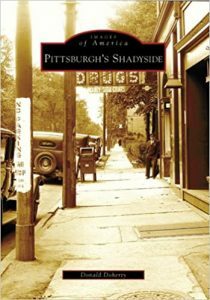 This entry was posted in Shadyside History on September 23, 2017 by don.